It’s the first of the five Monuments and if this is anything to go by, we are going to be in for a hell of a year. Known as the sprinter’s Monument, Milan-San Remo is 260km of wearing down (riders and spectators alike! ), 20km of attacks and 10km of sheer Poggio madness. And today, the madness went right to the photofinish with Michal Kwiatkowski (Sky) pipping Peter Sagan (Bora-hansgrohe) after the world champion busted the race open on the Poggio. Julian Alaphilippe (Quick-Step Floors) rounded out the final podium. How can I pick one of these riders from the leading duo? 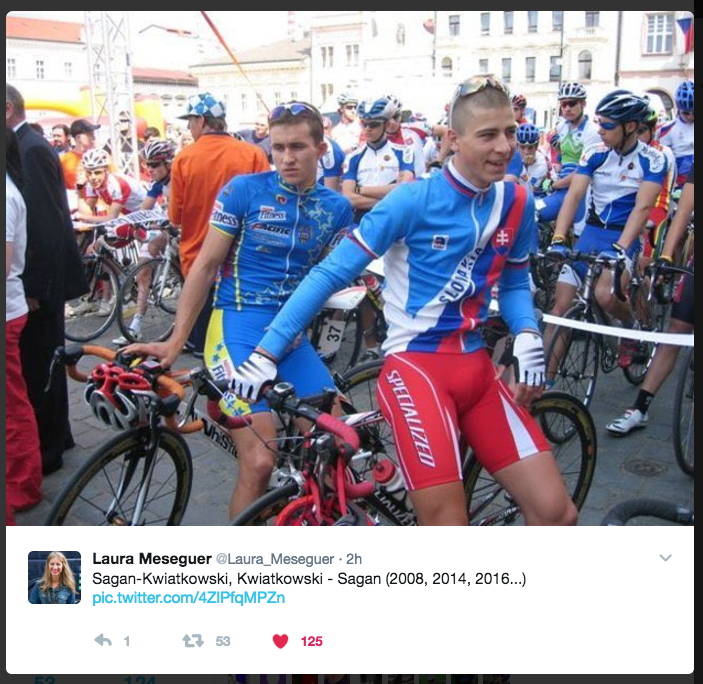 Michal Kwiatkowski and Peter Sagan have been trading wins and losses since they were pups. Having ridden together for so long, for all of Sagan’s power and dominance in races, Kwiatkowski doesn’t ever look intimidated by him – and he proved that in 2014 with his Strade Bianche win, blasting past Sagan on that beautiful climb into Siena in the last kilometre. 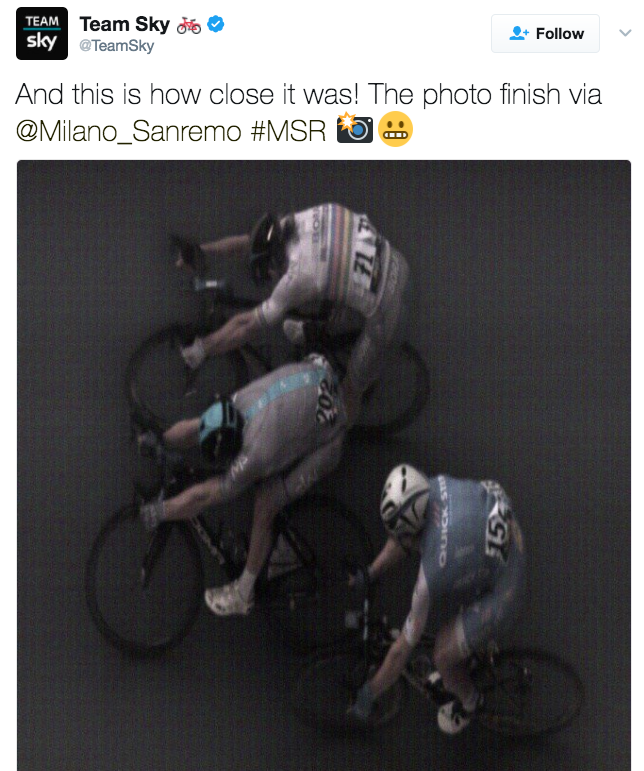 And of course, he beat the world champion again today – using Sagan’s power against him to take a photofinish win. The first Monument won by a Polish rider, ever. However, could Kwiatkowski have won if the Lion of the Peloton hadn’t roared out of the pack on the Poggio to bust the race wide open? I don’t think so. Only Kwiatkowski and Alaphilippe were able to follow his blistering attack – Sagan makes riding look so effortless but he really looked like he was giving it everything to get the gap so it must have been like trying to chase a locomotive. Both had to do some very hard riding to catch up – and it took them a while. I’m sure Sagan was hoping he would be able to go it alone and beast it to the finish, just slowing down enough to salute the crowd. But that he wasn’t strong enough to do that meant that he was almost too strong for the win as neither of his two break companions did much work at all in those final 10km. By the time Sagan led himself out to sprint for the line, his monumental effort to put enough distance between himself and the rampant peloton took enough out of him that all three came to the line together – and Kwiatkowski had just that bit more energy in the bike throw to cross the line first. There are two ways you can do a Cancellara. You can get the jump on the peloton, get a couple of bike lengths and never be seen again until you’re collecting the trophy. Or you can get the jump on the peloton, have a few riders bridge to you who take advantage of your strength and will to win and pip you at the post. Love it or loathe it, Peter Sagan is going to be a marked man in these races for years – just as Cancellara was a marked man. He will get marked out of races altogether or lose races because he dragged the winner to the line or change it up and win big with style and panache. And each of those results are what racing is all about. Just a little dream of mine.